When you are being seen in Radiation Oncology, park in the Radiation Oncology designated parking lot, located off E. Medical Center Drive between the Cancer Center and the Emergency room entrances. Obtain a Radiation Oncology hang-tag from the reception desk. This tag is to be displayed in your vehicle during the time your vehicle is in the Radiation Oncology parking lot. Parking for Magnetic Resonance Imaging (MRI) - is in Parking Structure P2. Locate the parking structure elevators. Take the P2 elevator to Floor 1. Exit the elevator, turn right and enter the Taubman Center. Once inside, turn to your right and proceed down the hall. The Information/Registration Desk is on the left. Here you will receive your "blue hospital card" or you may update your registration information. Continue down the hall past the Welcome Desk on your right. Go past the University Hospital lobby, through the first set of double doors. Just before you reach the Surgery Waiting area (red column), the East elevators and escalators will be on your left. 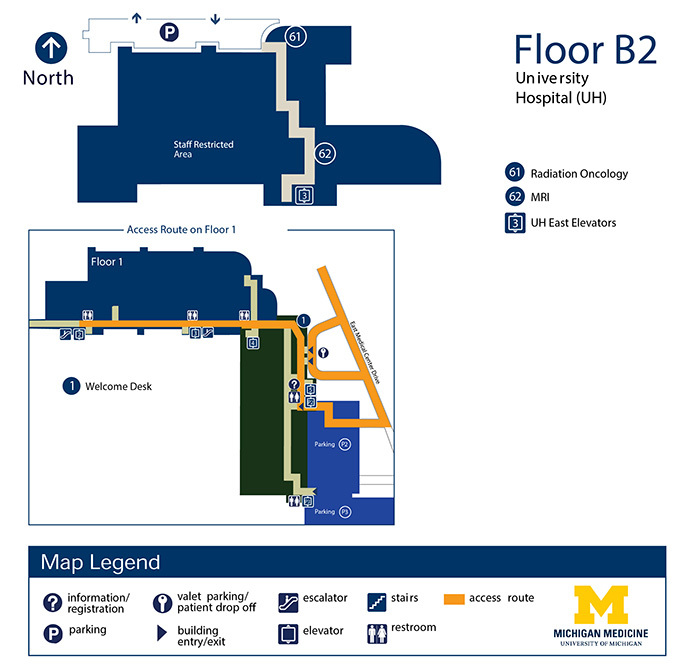 Take the East Elevator to basement Floor B2. Turn right out of the elevator, and turn right again into the hallway. The Magnetic Resonance Imaging (MRI) overhead sign will be in front of you. Turn left and follow this hallway almost to the end. You will see the Magnetic Resonance Imaging (MRI) on your right.